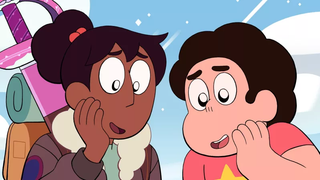 Steven and Connie love it. Just the right mixture of sentiment and melancholy. A Softer World, for its 12-year runtime between 2003 and 2015, was one of the most beautiful webcomics one could find. Mashing up weird little tone poems, waffling between fluffy purple prose, goofy humor, and unsettling melancholy, with matching photography, it was an immediately striking and beautiful piece of work, created by writer Joey Comeau and artist Emily Horne. 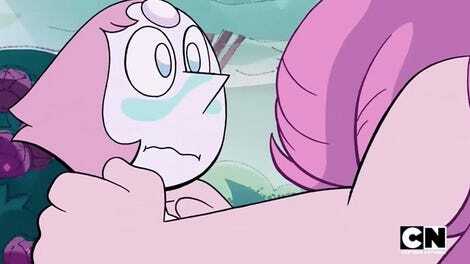 It’s a vibe that mixes really well with Steven Universe, as the tumblr “a softer universe” proves handily. The curator’s work, mixing carefully chosen screencaps with text from the original comic, works fabulously, and Steven Universe is the perfect container for the wistfulness and melancholy that characterized the original. Here are a few of my favorites below (there are some spoilers, so heads up). The tumblr only started updating again recently, but I’m hoping it continues, because these are my new favorite things. Do it for her? I’ll do it for A Softer World. And Steven Universe fan works, which are often incredible.